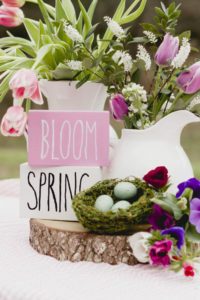 I am all about everything Springtime right now and this sweet and simple spring tablescape is just that. 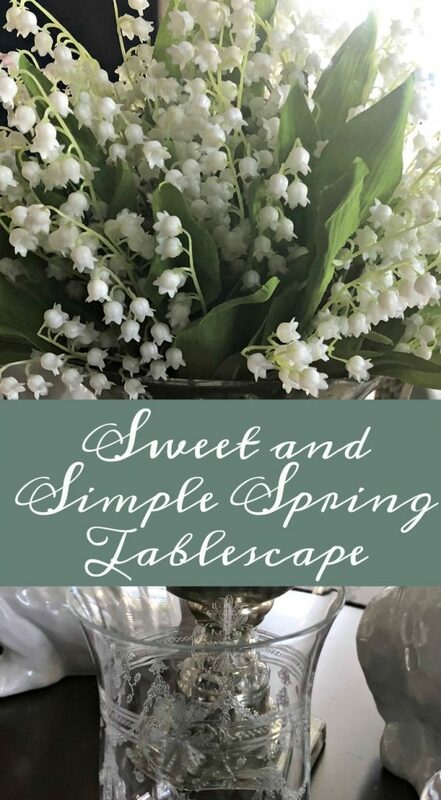 It is simple, just white and silver with a little gray and the green leaves of my lily of the valley. 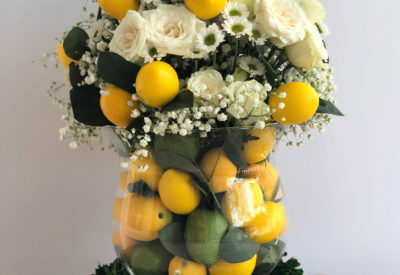 I really wanted to make a white fresh flower arrangement in this mercury glass urn, but I wasn’t happy with any of the white flowers where I usually pick mine up. Not to worry, I had picked up these artificial lily of the valley and was ready to put it to use. Lily of the valley is one of those artificial flowers that looks fairly realistic, especially when massed like this vase full. 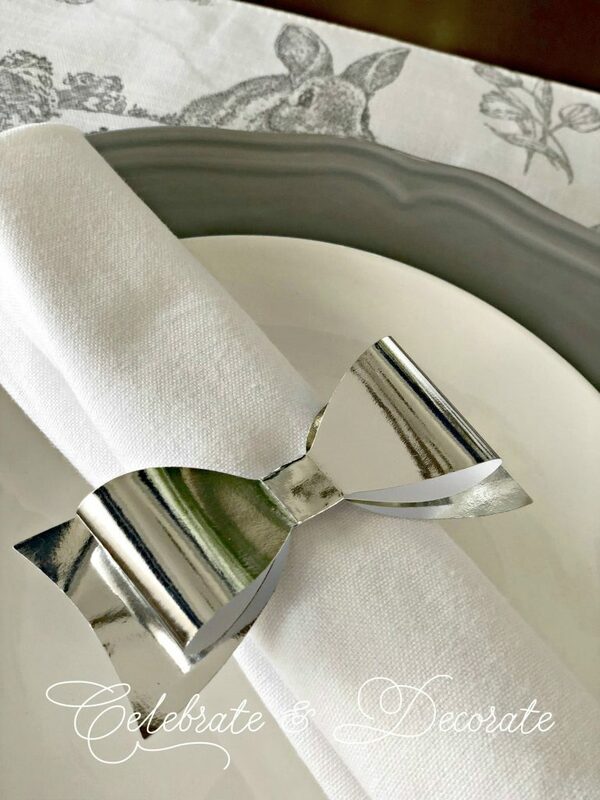 Staying with the idea of simplicity, I rolled my white napkins and secured them with a thin silver ribbon and added a simple silver paper bow. 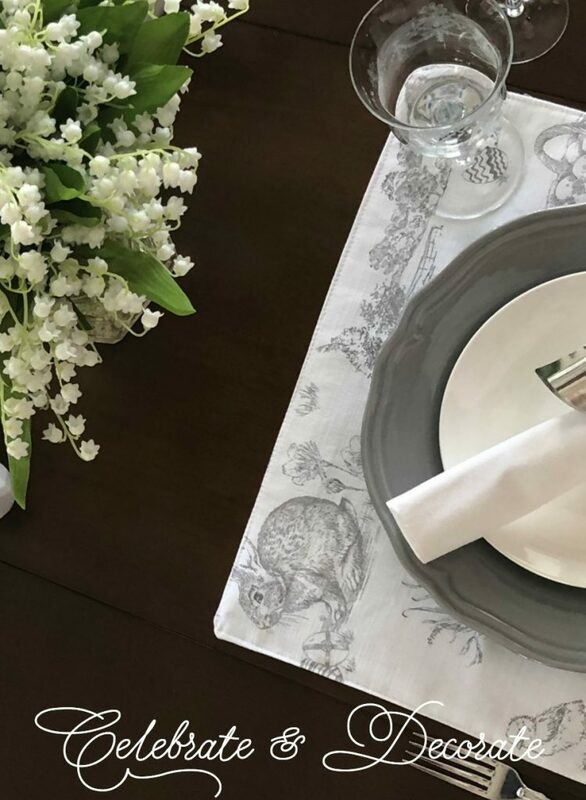 These placemats from Home Goods were the inspiration for my gray and white table, even though I was going for spring more than Easter. I describe this tablescape as simple because that is what it is. Simple gray dinner plates topped with plain white salad plates are paired with my everyday flatware. I think the lily of the valley looks even nicer when seen from above like in this photo. 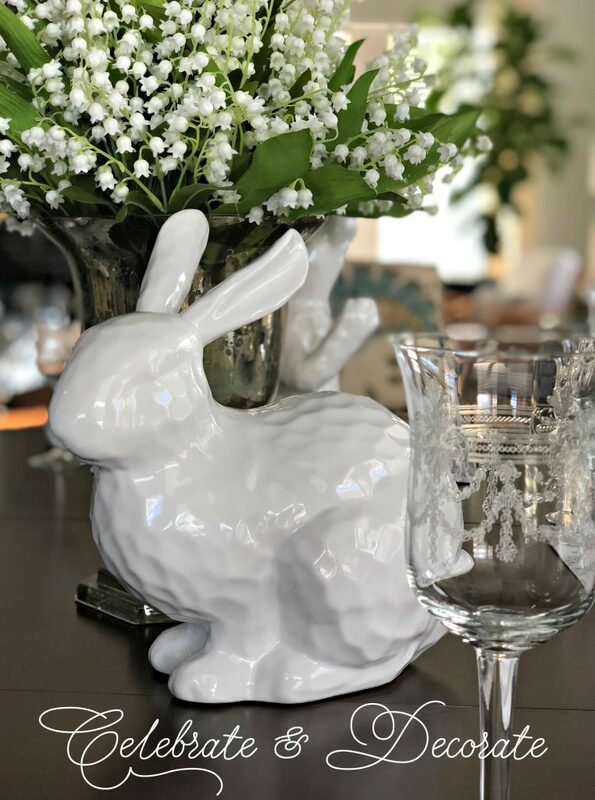 The pair of white bunnies were also Home Goods finds but the Bohemian crystal water and wine goblets are something my husband had when we got married. The pattern is so delicate and intricate, which melds well with my more simple place settings. What a lovely table setting! The lily of the valley faux bouquet looks so real, better than my real ones that grow every Spring. 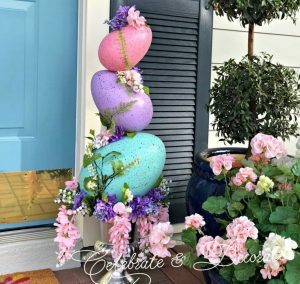 I don’t usually decorate for Easter, just not into the bunny theme, but do so with Spring flowers and colors. 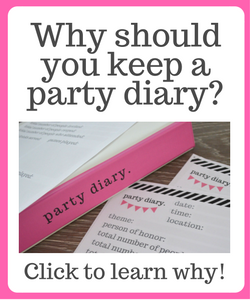 You sure have lovely ideas and know how to put things together to look beautiful and elegant. My best to you! Thank you so much Maria. I don’t like getting kitschy for Easter, but I find I am always picking up more bunnies, they just call to me. I usually go with simple ones like these. 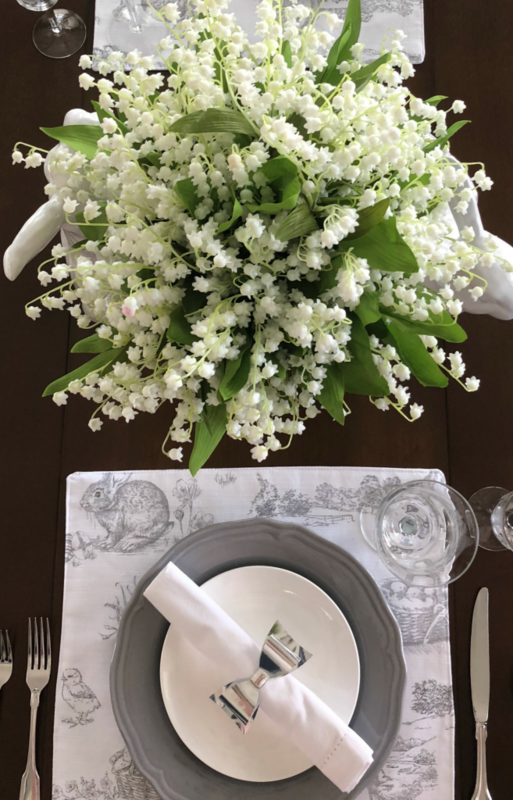 Even though the placemats are definitely Easter themed, I felt like this tablescape was kind of simple and just hinted at the coming of spring. 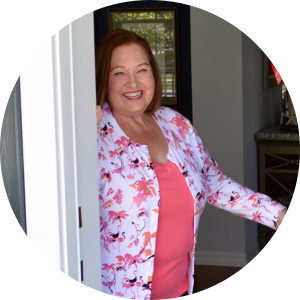 Thank you so much for your kind words and for coming by to visit at Celebrate & Decorate. I always appreciate hearing from my readers! Very pretty! Those Lily of the Valley are so lifelike! We have had 5 days of rainy grey skies and I am so ready for spring! Sometimes you have to fake it, like with the lily of the valley. I have always enjoyed using them. They are my favorites, since I was born in May and they are one of my college sorority flowers which makes them even more special. Hang in there! Spring is coming! Elegant and welcoming! 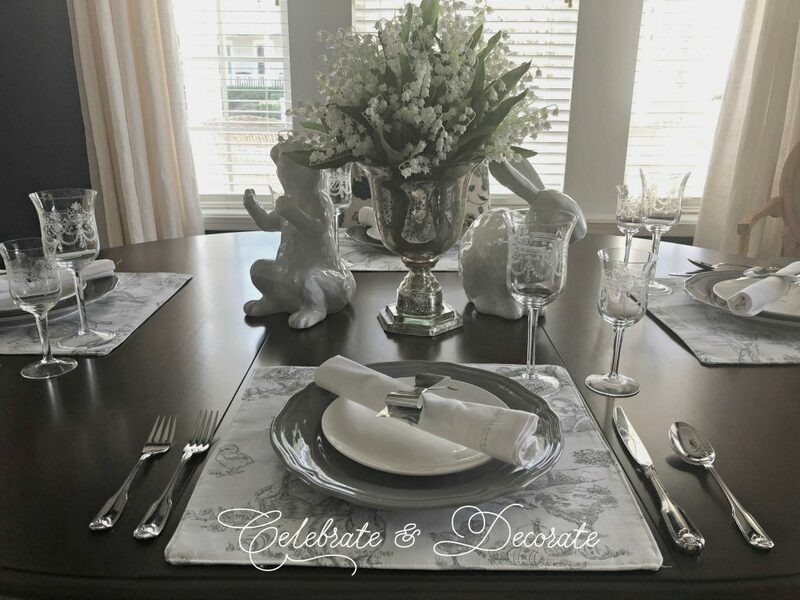 Love the placemats and the cute white bunnies. 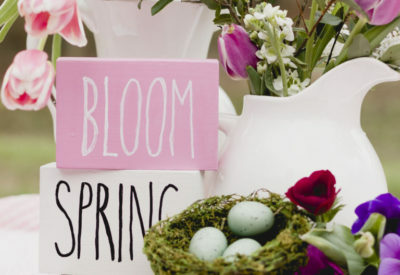 Every element works perfectly together to accomplish your goal of welcoming spring. Your husbands heirloom goblets are gorgeous. 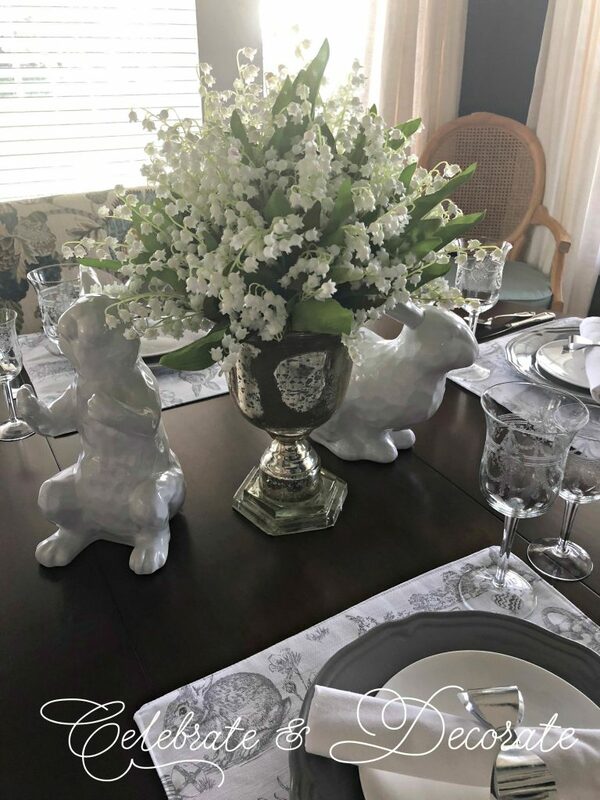 Thank you Bonnie, I am loving all of the colors of spring out in the stores right now, but I thought this would make a more transitional table. I love those goblets too, but they are so delicate, I always worry about chipping or breaking one. They are lovely to drink from. I Iove this table setting! It is so elegant but simple. This is something I could put together; you make it look easy, Chloe. Thank you Lynn, it is a very simple table, even perfect for a weeknight dinner. Very pretty, Chloe. The lily of the valley arrangement is really nice, especially the overhead shot as you noted. Thank you Rita. I LOVE lily of the valley, it is one of things I really do miss about gardening in Ohio. I like it a lot! 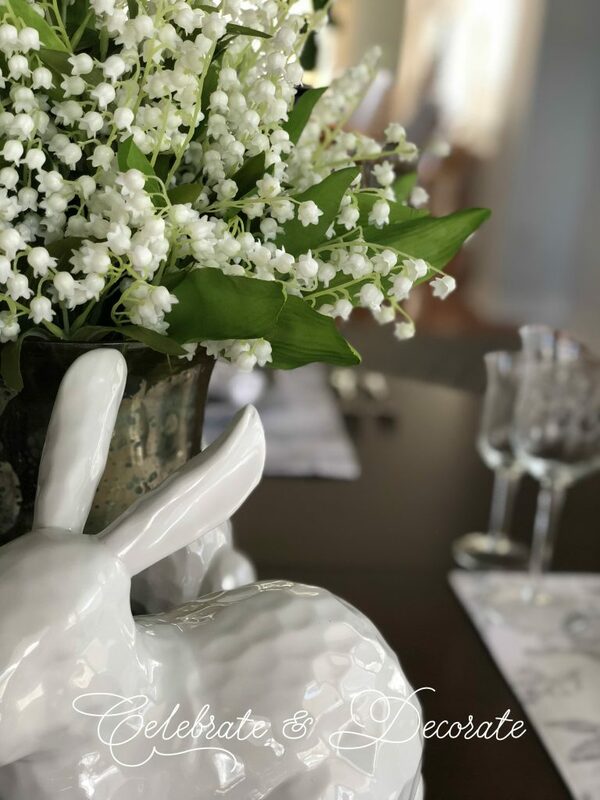 I love lily of the valley – perfect look for your setting. Cute placemats! Your tablescape is absolutely fanstatic! I love everything about it. Your Lilly of the valley is drop dead gorgeous. I plan to put some in my garden this summer. Thank you so much Ivory! Lily of the Valley can be expensive to buy, but buy a few pips and get them started somewhere you won’t care if they get out of control, because they can take over. Mine bloomed in early May in Ohio. I really miss being able to grow them here in Florida. Oh my, thank you so much for the tip about the Lilly of tge Valley, because I had know idea they take over. I’ve bought flowers/ground plants that took over my flower garden, and each time I almost cried, trying to rid the garden of them. I never want to do that again. I guess I will have to buy fake ones, and love them in a nice vase. Favorite table I’ve seen in a Looong time. Love your Lilly of the Valley, I am a flower snob,very used to going outside and using what we have planted. When we can’t do that, silks have come a long way. Beautiful Table! Oh my goodness, thank you so much for your kind words, Barb! Yes, I really miss being able to grow Lily of the Valley here in Florida, it was a treat to be able to pick it in Ohio! 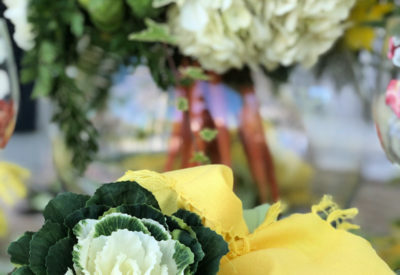 I am with you, always fresh flowers if I can! Love it ! Nice job! 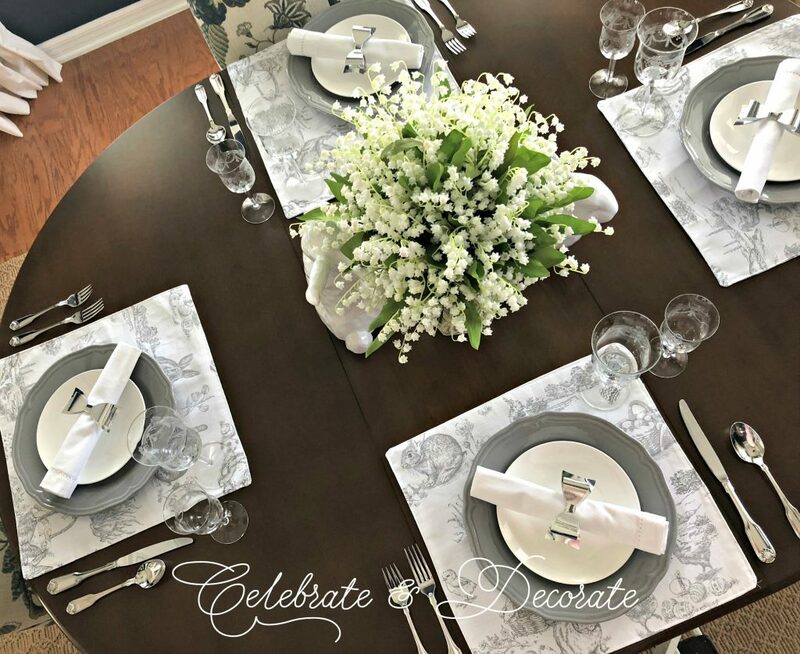 It is perfectly beautiful Chloe, I love the elegant simplicity of all the white and those placemats are gorgeous! Love those goblets but I am fascinated by the silver bows. Did you make them or buy them ? I think spring is over for us in FL with temps in the 80’s. I am with you, Myrna, it is too hot, too early! Those bows are from Target. They were on clearance, 4 bows for $1.50, one each, gold, silver, black, white. I guess you will be seeing the other colors in the future since I had to buy 4 sets to get 4 silver ones! They are gift bows from their Spritz line of gift wrap. I love Lily Of The Valley. I would never have guessed yours were artificial. They are completely believable. Your tablescape is lovely. Thanks for sharing. This is such an elegant tablescape. I love the Lillies of the Valley. I do miss the northern flowers sometimes. Such a pretty table. I love those placemats you used as inspiration. My old neighbor had Lillies of the Valley in her garden, they took over and where everywhere!! So I was always afraid to plant them, but they are so sweet and make the perfect centerpiece. So elegant any idea where you purchased the lilies? The lily of the valley came from Michael’s. I am still enjoying having them out in my living room!